2015 – Botosani: City Hall Gallery. 2016 – Spring Saloon - “Stefan Luchian” Art Gallery – Botosani. Works in private collections: Romania, Franta, Italia, Anglia, Germania, Grecia, SUA, Cipru , Iran, China,Canada, SUA. Natures greatest lesson becomes essential for FLORIN PRODAN: that of building an artistic vision, a manner of understanding and that of transfiguring reality. In fact the attachment to the miracle of reality is related to the direct experience of this painter of "plain air" even if, beyond sensation, this is a science of plastic. 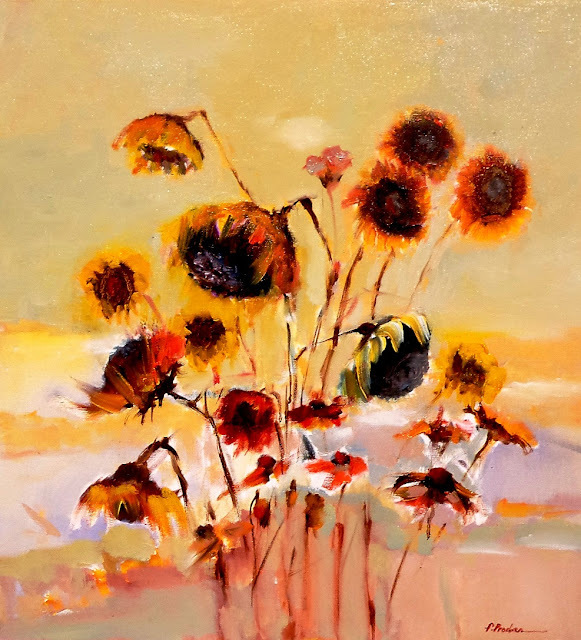 FLORIN PRODAN is well seen by the viewers through the quality of the colors carefully spread on the painting blade, generous and tender, melancholic and vital, subtle and unctuous. This creation matches perfectly with emotions and delicate feelings; similar to Lucian Blaga, this painter <<doesn't want to break world's light crown>>, but to touch it with his looks, then seeing it through the inner eye of the creator - a noble reconstruction of the being in a supreme gesture of love. FLORIN PRODAN evolved from an art exhibition to another, his artistic stamps gaining more and more distinct sounds announcing a natural growing-up. These ways of saying serve also the quality of plastic thinking. The time of harvest is here. Art critique - member A.I.C.A. FLORIN PRODAN is a painter of vibration, where nature means rhythm, a plastic rhythm within cosmic vibration. His art can be from anywhere, his image reconstructing nature, keeping in mind not only the essential but also the affective. FLORIN PRODAN assumes a certain palette of colors that define him in its own manner: sensible in musical colors interfered by grays which define the art sense that becomes the bridge of his composition. FLORIN PRODAN won his own place in the artistic world. His paintings have a warm color, always present to the eye: that of building a poetry in colors. Figurative, being descriptive with essential tendencies of shapes and underlying colors by juxtaposing grays and pure backgrounds, FLORIN PRODAN uses nature as a pretext to express his sensibility. 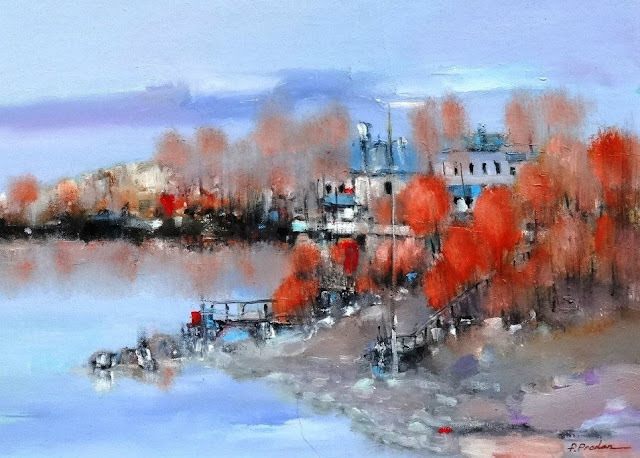 FLORIN PRODAN is a lyric, each of his paintings has a specific poetry. Attracted to the Moldavian landscape, FLORIN PRODAN succeeds to transfigure in a convincing and sensitive way to bring to the viewer the miracle of the reality, but also his soul's debate. It's such a warmth in his action: the winter landscapes succeed to overwhelm actions under the empire of such ancestral childhood memories.